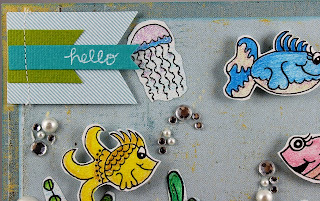 Queen Kat Designs: Hello, Fishies! Hi, guys! I'm back again with another card that I made with the new Under the Sea stamps by Vikki Douglas. 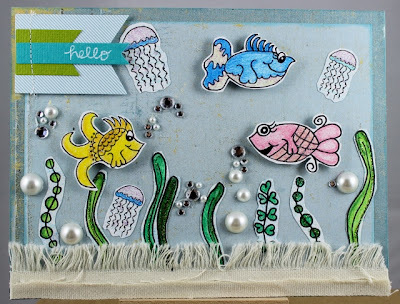 I wanted the card to look like an aquarium, so I used plain backgrounds rather than patterns this time. I colored and Stickle'd the images and cut them out with just a little extra white space around them. 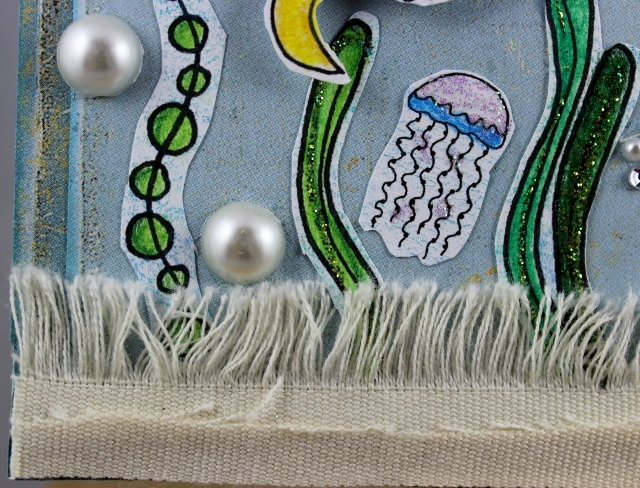 All of the plants and the jellyfish (aka Squishy, Squishy Jr., and Squishy III) are adhered flat onto the card, while the fish are adhered with pop dots so that they are floating above the card's surface. I added a little flag for the sentiment, and lots of gems and pearls for bubbles. 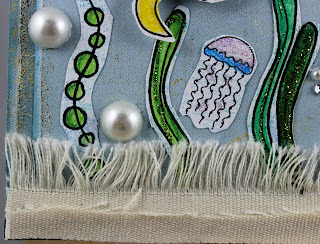 The sandy bottom of the tank was made with canvas ribbon. I cut the solid part of the ribbon and layered a piece that was mostly un-frayed on top of the one that was really frayed to create some layers. I just love these little fishies, and I can't wait to see what you QKD fans do with them! So get on over to the Queen Kat Designs store and check them out! Love your use of the canvas ribbon! Very creative!